What Indians track and field records will fall this time around! 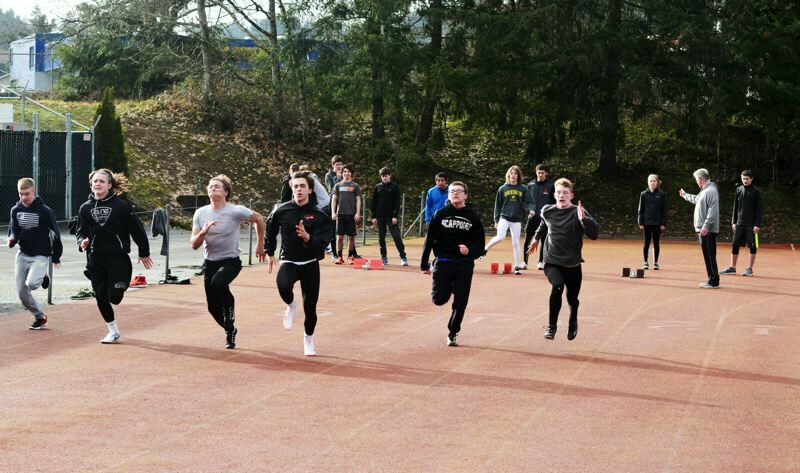 Scappoose will see what 45 new runners, jumpers and throwers can do while its Class 4A state contenders go after the Tribe's next individual championship (the boys have won 17 and the girls have won three) at Hayward Field at the University of Oregon in Eugene. Mychal Hortert, Matt Shoun, Justice Oman and Stephen Lowe were the latest Indians boys to win it all (in the 1,600-meter relay five years ago), and Charlie Davidson won the girls' 1,500 run the year before that. "There's a lot of enthusiasm, which is great because the weather hasn't been great," said Dave Harley, Scappoose's coach of 22 years. "We set high, clear expectations, and as soon as the kids buy in, they do a really good job." The Tribe boys are seven-time Cowapa League champions, and the boys and girls were both eighth at state in pursuit of their first team titles. The girls came up second in the league to repeat Class 4A champion Astoria. In the lead for the boys is John Kavulich, a junior who set the boys' school 1,500 run record of 4 minutes, 9.68 seconds last year and wrote the new 3,000 run record (8:44.60) on the way to second — by four hundredths of a second to new North Bend senior Michael Brown — at state. Michael Gift and Jacob Munoz, a senior and junior, can help the 400 relay get back to state from fourth. 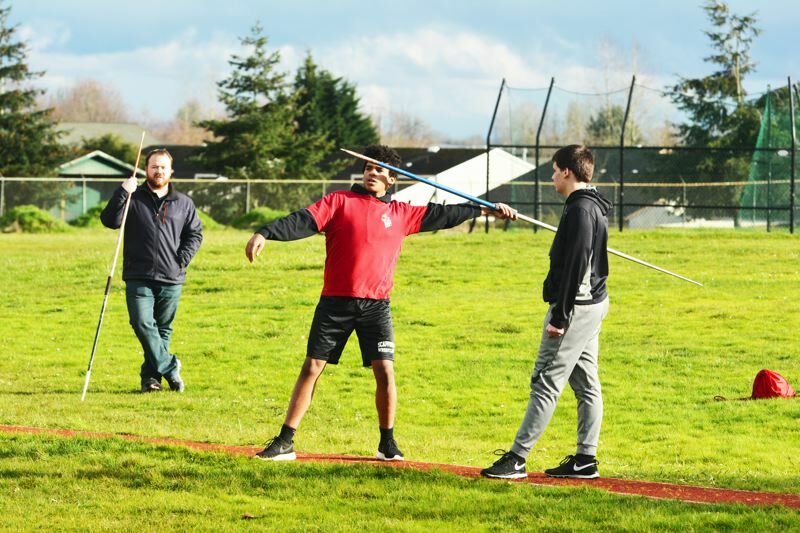 Sawyer Christopher, a junior, improved on his own school javelin record at 192 feet, 11 inches last year, and Nate Maller (171-7), also a junior, is second all-time. Jake Haddon set the 110 hurdles record (22.94) as a freshman two years ago. In the girls' circle, Linnaea Kavulich is back as a junior from third in the state 1,500 run, and set the girls' school 3,000 run record (10:26.53) on the way to fifth in Class 4A. She and Alyssa Spang, a new senior who set the girls' school long jump record (16 feet, 5.75 inches) two years ago, went fourth in the state with the 1,600 relay. Spang and Mackenzie Ela, a junior, helped set the school 400 relay record (50.61) last spring. Georgia Benner (a junior), Emily Marquardt and Grace Rieman (seniors) helped to set the girls' school 3,200 relay record (10:41.07). "[Kids] naturally gravitate toward what they want to do," Harley said. "You see their natural talent and give them a gentle steer, but usually they steer themselves. 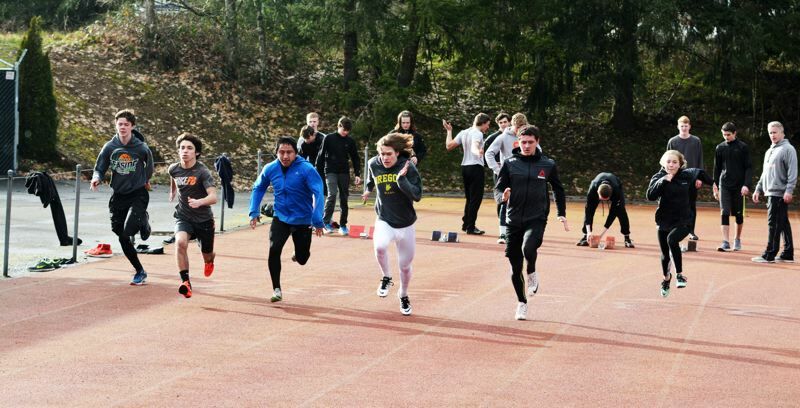 I always refer to [track and field] as a three-ring circus: Distance runners, sprinters and jumpers, and hurlers." The Indians are scheduled to open the season against host St. Helens and Class 3A Rainier at 4 p.m. on March 22 at Doc Ackerson Stadium. BOYS' RETURNERS: David Fazio, sr.; David Leader, sr.; Christian Sterling, sr.; Jordan Vanderhoff, sr.; Kevin Bachman, sr.; Michael Gift, sr.; Antonio Guajardo, sr.; John Kavulich, jr.; Alex Hansen, jr.; Brennan Cox, jr.; Cameron Allen, jr.; Chase Bakkensen, jr.; Jacob Munoz, jr.; Jake Haddon, jr.; Janston Turner, jr.; Tevin Jeannis, jr.; Trey Bispham, jr.; Tristan Miller, jr.; Nate Maller, jr.; Will Harley, jr.; Josiah Oliver, jr.; Austin Norgaard, so. ; Connor McNabb, so. ; Jesse Oliver, so. ; Nate Riffle, so. ; Luke Kellogg, so. ; Tyler Kulp, so. ; Rylan Warner, so. ; Matthew Carrier, so. BOYS' NEWCOMERS: Alex Langlais, sr.; Scotty Redpath, sr.; Nico Roses, sr.; Daniel Tull, sr.; Dylan DeTroy, sr.; Dylan Newcomer, jr.; Zeddy Jamerson, jr.; Ben Warren, jr.; Blake Catt, jr.; Brandon Crain, fr. ; Brisyn Maller, fr. ; Ryan Lamma, fr. ; Conner Havlik, fr. ; Eric Bentler, fr. ; Henry Goldammer, fr. ; Isaac Reed, fr. ; Isaiah Ebert, fr. ; Jeremy Laird, fr. ; Jerico Archer, fr. ; Josh Lull, fr. ; Tommy Guajardo, fr. ; Tyler Holcomb, fr. ; Zane Pense, fr. ; Matthew Reed, fr. ; Max White, fr. ; Corbin Edson, fr. ; Andrew Padilla, fr. ; Ben Volinski, fr. ; Braeden Bost, fr. ; George Kilman, fr. ; Jaden Wardell, fr. GIRLS' RETURNERS: Grace Rieman, sr.; Emily Marquardt, sr.; Kirsten Brewer, sr.; Alyssa Spang, sr.; Carra Johnston, sr.; Nicole Nicholas, sr.; Ranay Laird, sr.; Linnaea Kavulich, jr.; Hannah Owens-Bowman, jr.; Ariana Long, jr.; Georgia Benner, jr.; Grace Comer, jr.; Karlie Ragan, jr.; Daphney Sleightham, jr.; Lea Brodala, jr.; Mackenzie Ela, jr.; Krystal Esterly, jr.; Claire Pine, so. ; Kayla Derrickson, so. ; Sara Pieper, so. ; Sierra Stafford, so. ; Natalie Kenoyer, so. GIRLS' NEWCOMERS: Alyson Worthington, jr.; Alyssa Baird, jr.; Kyleigh Weber, jr.; Trinidy Miller, jr.; Montana Poppenhagen, so. ; Autumn Bentler, fr. ; Angelina Seberger, fr. ; Emma Jones, fr. ; Emma Stylers, fr. ; Jordan Tull, fr. ; Kyrah Harrison, fr. ; Kelsey Ela, fr. ; Tess Conway, fr. ; Wendy Sanchez, fr. April 6 Seaside, Scappoose at Tillamook, 3:30 p.m.
April 19 Banks, Valley Catholic at Scappoose, 3:30 p.m.
May 3 Scappoose at Astoria, 3:30 p.m.